I loved the book, enjoyed the movie; however, the play really did bring the whole story to life (quite literally) giving the audience a whole new experience of this fantastic thriller. 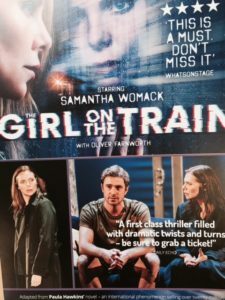 Credit must be given not only to the actors but to the wonderful ‘behind the scenes’ team – the set production was excellent and the use of lights, projected images and train sounds created believable images of Rachel on the train..
Samantha Womack plays the main character, Rachel. The play begins in Rachel’s messy apartment – old, empty wine bottles and rubbish everywhere.. Rachel like her flat is in a mess. Her husband has re-married and lives with his new wife and their baby in the home which was once hers. Rachel is struggling with her new, divorced life; she often binge drinks and suffers from black-outs relying on other’s to fill in the parts she can’t remember..
After one of Rachels’ black-outs, she returns to her flat with a wound on her head – she has some vague memories but nothing is clear… Rachel soon discovers that ‘Jess’ the girl she has been watching from the train has disappeared; Rachel becomes obsessed with trying to find out what has happened to Jess – whose real name is Megan. Rachel receives a visit from the detective DI Gaskill; will she remain as a witness or become suspect? Rachel almost turns ‘detective’ herself; as she learns more and more about Megan – in one of many weird twists, Rachel discovers that Megan would baby-sit for her ex-husband Tom and his new wife. Rachel ends up going to Megan’s house and speaking to Megan’s husband (Scott) pretending she is a friend of Megan’s?? Rachel believes Megan was having an affair as she spotted her from the train one day kissing another man, not Scott Megan’s husband… Who is the other man? Will Rachel manage to piece the missing parts of her memory back together? How did she get that wound on her head? 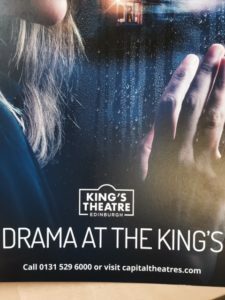 To take this story and deliver it so successfully on stage was in my opinion really impressive; there are lots of clever on-stage flashbacks where a character may be in the background whilst another character is describing what is happening in the foreground.. Along with the play’s leading lady, Samantha Womack who is pretty much in every single scene! (wow, so many lines to remember) She really did convey the emptiness of Rachel’s character convincingly… I also really enjoyed the scenes that DI Gaskell played by Scottish actor John Dougall; every so often there were certain words he would increase in volume! (I was hoping for him to shout out ‘there’s been a murder’) He definitely played his detective role with a hint of humour which I think everyone needs whilst watching a thriller. Kirsty Oswald who played missing wife Megan was also very convincing and again like Rachel had been involved in difficult relationships….